Ladies, you’ve probably had your perfect ring mapped out in your head since you were 15 but what really is the best diamond shape for your engagement ring? The round cut diamond is definitely the most popular diamond shape chosen by brides these days, representing approximately 75% of all diamonds sold. It’s shape and the way it is cut properly reflects the light, and maximises the potential brightness. But, even better than the round cut diamond is the beautifully cut Oval Diamond. The oval diamond possesses the same brilliance as a round cut diamond, however, oval cut diamonds have the advantage of an elongated shape, which can make the stone look bigger to the eye. In conclusion, an evenly cut Oval diamond is perfect for an engagement ring. 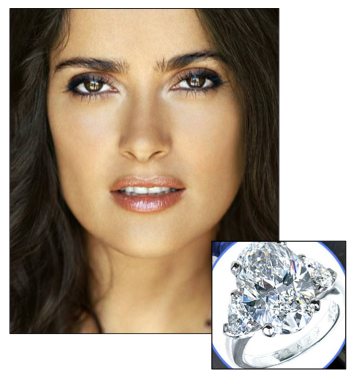 Like many celebrity brides of the past – Katie Holmes, Heidi Klum or Salam Hayek, who all chose an Oval cut diamond, you are probably looking for the effect in brilliance and shine but without losing out in your wedding budget. An excellent option would be an oval diamond engagement ring to give your bride that edge when showing off her new ring.